With just under 264 acres of land, Lockhart State Park is small but picturesque. 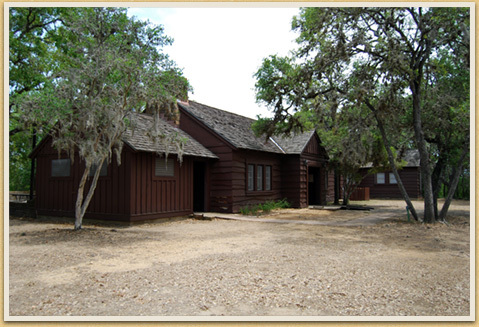 Set in Central Texas amid greenery of elm, oak, ash, and pecan trees, the park received federal funds and the construction skills of the men of Company 3803, who named their barracks Camp Colp in honor of the first, and longtime, chairman of the State Parks Board, David E. Colp, a onetime resident of Lockhart. In 1948, some years after the work was completed, the facility opened free to the public and featured a swimming pool and a golf course with an elevated first tee overlooking the area below. The park residence, which sits on level ground, was designed by Austin architect George Walling (with partners Kirk H. Scott, R. J. Hammond, and George T. Patrick). Drawing inspiration from immigrant German architecture, the dwelling has walls of stucco and stone, some half-timbering, and an outside stairway leading to an attic door. Nearby is the swimming pool, placed close to scenic Plum Creek to make use of the area's fresh spring water supply. For the elevated bluff overlooking the surrounding countryside, architect Olin Smith of the State Parks Board's Central Design Office designed a hilltop refectory, using wood-frame construction clad in wane-edged cedar siding. Scattered throughout the park are picnic tables, dams, bridges, and trailheads that display the CCC's simple and rather elegant designs. Taken together the CCC features, geography, and natural environment form a pleasing composition. Caldwell County, 4 miles south of Lockhart, US Highway 183 to FM 20 to Park Road 10. Park Road 10, Stone Bridge, Combination Building (currently the recreation hall), Residence, Bath House Pavilion, Furniture (at the residence), Decorative Outdoor Lamps and Hardware, Concrete Water Storage Tank, Dam, Trailhead Steps, Arched Bridge, Culverts, Foot Bridges (sections replaced), Well, Water Fountain, Steps, Bench, Picnic Tables, Outdoor Fireplaces, and Golf Course. The Swimming Pool is no longer in use.